Under the direction of famed explorer Porter Stone, an archaeological team is secretly attempting to locate the tomb of an ancient pharaoh who was unlike any other in history. Stone believes he has found the burial chamber of King Narmer, the near mythical god- king who united upper and lower Egypt in 3200 B.C., and the archaeologist has reason to believe that the greatest prize of all—Narmer’s crown—might be buried with him. No crown of an Egyptian king has ever been discovered, and Narmer’s is the elusive “double” crown of the two Egypts, supposedly pos­sessed of awesome powers. The dig itself is located in one of the most forbidding places on earth—the Sudd, a nearly impassable swamp in north­ern Sudan. Amid the nightmarish, disorienting tangle of mud and dead vegetation, a series of harrowing and inexpli­cable occurrences are causing people on the expedition to fear a centuries- old curse. With a monumental discovery in reach, Professor Jeremy Logan is brought onto the project to investigate. What he finds will raise new questions . . . and alarm. 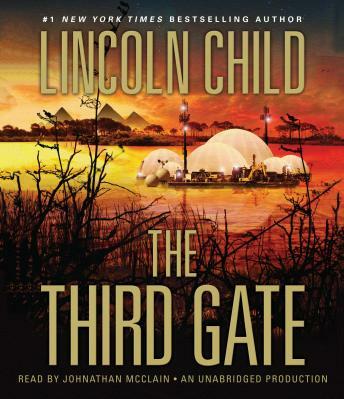 In the hands of master storyteller Lincoln Child, The Third Gate breaks new ground and introduces a fascinating new protagonist to the thriller world. Not bad, though a bit predictable. Treasure hunts are always fun to listen to. Treasure hunters always go where they shouldn't after the wrong relic. This time it is Egypt. It's dangerous to seek, and more dangerous to find. I like detail and can overlook the unreality quite a bit for a good adventure. Quite a page-turner and a really exciting ending.